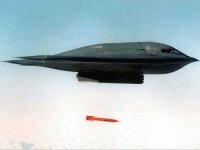 The Pentagon completed tests of its newest B61-12 atomic bomb in October 2015. Washington planned to deploy bombs of this model to an airbase in Germany. The US completed the final test of the upgraded B61-12, but with no highly enriched uranium or plutonium warhead. The test was conducted from an F-15E bomber at Tonopah Test Range in Nevada on 20 October 2015, according to the National Nuclear Security Administration (NNSA). The agency underscored that the bomb "demonstrated successful performance in a realistic guided flight environment." "Completing this guided B61-12 flight test provides additional evidence of the nation's continued commitment to our nation’s security and that of our allies and partners," the NNSA said in a press release. 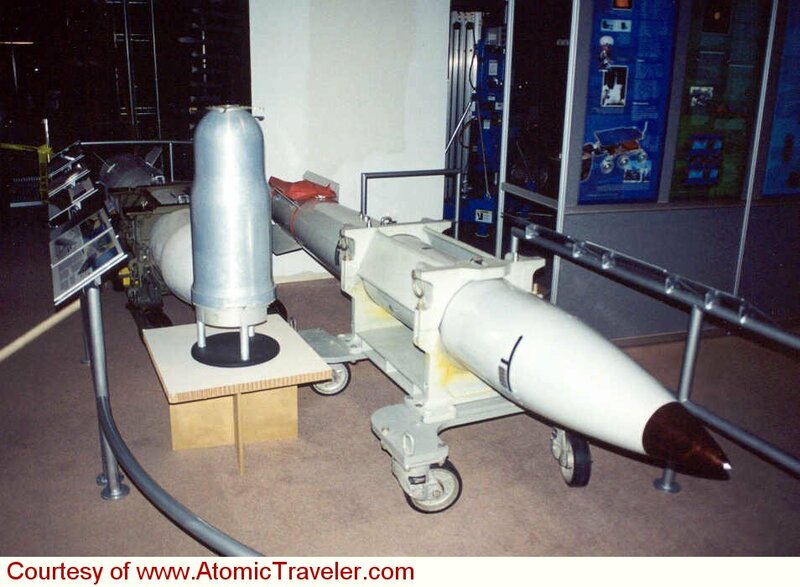 Earlier it was reported that the Pentagon plannws to deploy 20 B61-12 bombs to the Buchel Air Base in Germany. The B61-12 is another modernized version of the B61 bomb developed in the middle of the 1960s. According to Russian military analyst Viktor Murakhovsky, the bomb has some significant differences from the previous version. "The bomb has two key differences. It has the so-called scalable nuclear yield which allows for controlling the yield to a certain extent. In addition, its aerodynamic configuration and control surface makes the bomb extremely high-precision. The previous versions were developed several decades ago. Since nuclear warheads have limited operational time they need to be replaced from time to time. With the new bomb, the US has incorporated high-precision developments with the scalable nuclear yield technology," Murakhovsky told Radio Sputnik. Deployment of nuclear weapons outside national territories along with the concept of nuclear weapons sharing violates the Treaty on the Non-Proliferation of Nuclear Weapons, the Russian Foreign Ministry noted. According to Murakhovksy, the US ignores Russia’s stance on the issue. "The US nuclear strategy and the US National Military Strategy presume the so-called struggle at front lines. The US has more military bases than any other country. A significant number of US forces are deployed overseas. Russia has repeatedly told the US to bring home its nuclear weapons before further talks on the reduction of nuclear weapons. Russia has brought back all its tactical nuclear arms on its territory and does not deploy them abroad. Unfortunately, the US does not follow our example and would continue to deploy nuclear weapons to Western Europe, South Korea and, according to certain data, to Japan. This is the strategy," the analyst said. The US possessed approximately 520 B61 bombs as of 2014; about 200 were assigned to NATO's burden-sharing mission in Europe, hosted by NATO member countries at bases in Belgium, Germany, Italy, Netherlands, and Turkey. The B61 thermonuclear bomb, first produced in 1966, has developed into an extremely flexible weapon. Its many different modifications has made it able to fill the multipurpose needs of the military. Major modifications were made to the B-61 in 1966, 1975, 1977, 1979, and 1991. Designed by the Department of Energy's Los Alamos National Laboratory in northern New Mexico, the lightweight bomb could be delivered by the Air Force, Navy and NATO planes at very high altitudes and at speeds above Mach 2. The 141.6-inch long, 13.3-inch diameter bomb averaged approximately 750 pounds, but actual weight varied with each modification. In 1962 work began on the B61 design program to create a flexible lightweight tactical thermonuclear weapon. 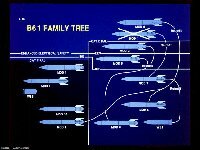 The B61 series was developed to replace older, tactical Air Force nuclear bombs such as the B28, B43, and B67. Its most recent modification, the B61-11, was introduced in 1997. 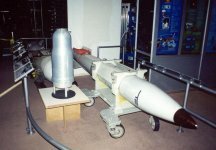 The physics package of the B61 has been adapted to yield several other warheads - the W-80, W-81 (now retired and dismantled), W-84 (now retired and in the inactive stockpile), and the W-85 Pershing II warhead (which was retired, and then readapted to yield the B61 mod 10 variant). The B61 can be dropped at high speeds from altitudes as low as 50 feet. 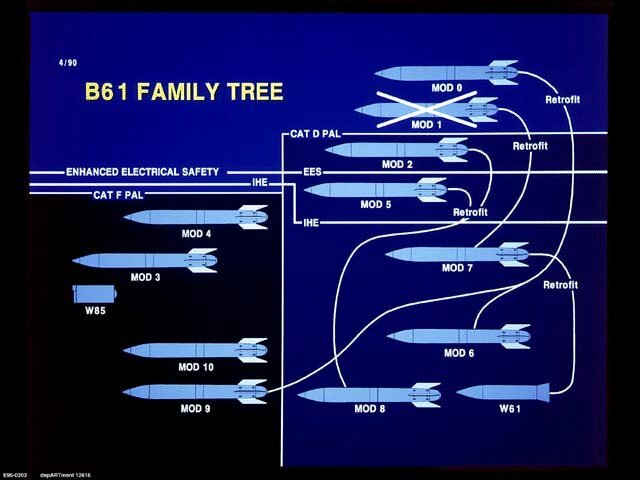 As many as 22 different varieties of aircraft can carry the B61 externally or internally. This weapon can be dropped either by free-fall or as parachute-retarded; it can be detonated either by air burst or ground burst. The B-61 has a 24' kevlar ribbon-type parachute, capable of slowing the ~700 lb weapon from 1000mph to 65mph in about 2 seconds. The retarded ground burst is also called "laydown" because the weapon lies on the ground for a period before detonation. This allows the delivery aircraft to escape. The B-61 thermonuclear bomb, first produced in 1966, has developed into an extremely flexible weapon. Its many different modifications has made it able to fill the multipurpose needs of the military. Major modifications were made to the B-61 in 1966, 1975, 1977, 1979, and 1991. 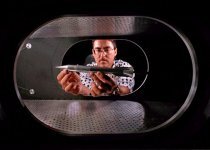 Designed by the Department of Energy's Los Alamos National Laboratory in northern New Mexico, the lightweight bomb could be delivered by the Air Force, Navy and NATO planes at very high altitudes and at speeds above Mach 2. In 1974 Sandia designed a strong link/weak link system to insure against unintentional nuclear detonation of nuclear weapons in normal use and in accidents. This design was first fielded in 1977 in the fifth modification of the B61. The 141.6-inch long, 13.3-inch diameter bomb averaged approximately 750 pounds, but actual weight varied with each modification. Mods 3, 4, 7, and 10 have Cat F PAL3 and use insensitive HE (IHE) in primary. Mod 7 is a converted Mod 1 upgraded with Cat F PAL and IHE. The B61 Radar Nose is in full-scale engineering development concurrently with AlliedSignal to support the 9/2000 DOE directed schedule. The design uses the MC4033 common radar to replace the existing 30-year-old tube type radar. The radar nose provides multiple height of burst radar fuzing, contact fuzing, and laydown shock mitigation. The project, supported by the Revolution in Engineering and Manufacturing program, is investing in modeling and simulation to augment the test and evaluation program to reduce qualification cost and cycle time. The B61-4 Type 3E Trainer is a system that the US Air Force will use to practice loading and handling operations. The Warhead Simulator Package is a key component of the Trainer, which simulates the electrical functionality of a real War Reserve weapon. The new trainer provides a significant improvement by allowing DoD personnel to realistically practice performing lock/unlock and prelaunch arming/safing operations without exposing a real nuclear weapon to vulnerabilities. During 1999 the SA3960 Permissive Action Link (PAL) Subsystem Simulator application-specific-integrated-circuit (ASIC) was developed as a key element of the Advance Code Control (ACC) architecture in support of the B61-4 Type 3E Trainer. The ACC architecture was developed to provide efficient balance between hardware and software in embedded real-time systems. The ASIC was designed and produced in little more than a year, with a cooperative effort between the systems, design, and production groups. It is the largest to date (~120K gates) produced by the Microelectronics Development Laboratory. The First Production Unit of the Trainer was delivered in 2001. 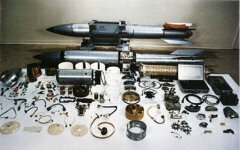 The world can rest more assured of its safety because of several alterations (ALTs) completed on all B61-3/4/10 weapons located outside the continental United States during 2002. ALTs 335, 339, and 354 enhance the safety, use control, and reliability of these retrofitted weapons. Other significant accomplishments include retrofits to allow recoding capability using no-knowledge, end-to-end encryption with the Code Management System; characterizing the glass-to metal seal in the Lightning Arrestor Connectors; and qualifying a powder coat process to replace liquid paint. These projects are supported by hundreds of people across the complex. A full-scale B61 experiment in an Air Force transonic wind tunnel during 2002 provided Laser Vapor Screen images of the vortices formed by the spin motor plume-freestream interaction and counter-moment data caused by the interaction of the vortices with the B61 fins. The counter-moment data was used with flight test data, Sandia vortex-fin interaction experimental research results, and ASCI fluid dynamic code predictions to construct a credible simulation-based capability for predicting spin rates and rolamite closure probabilities across the delivery envelopes for each B61 mod. 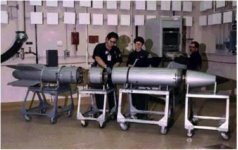 The FY 2002 DOE budget request supported laboratory activities to complete the ongoing studies to refurbish the B61 (some components of which are more than thirty years old), to initiate development engineering to support a first production unit in FY 2004, and to begin the development of a plan for certification of the B61, with a refurbished canned subassembly. 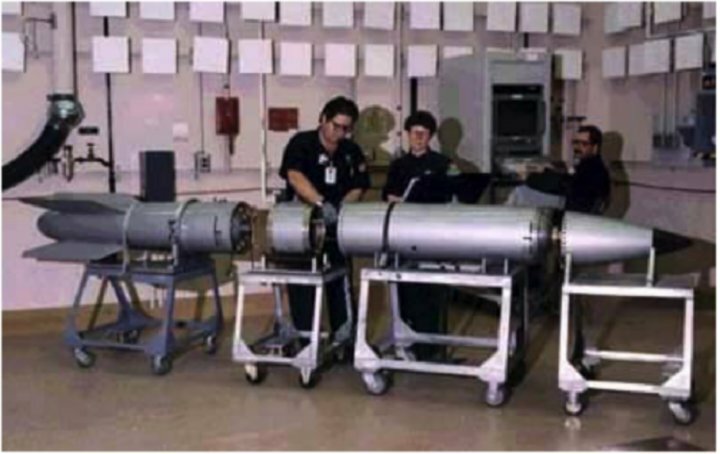 NNSA and DoD are working to identify refurbishment options for the aging B61-7/11 Canned Subassembly (CSA) and associated cables, connectors, some limited life components, and foam components. The study effort was completed in late FY 2002. Development Engineering began following Nuclear Weapons Council approval in late FY 2002. This program will use systems engineering approaches, and the planned FPU of the refurbished B61-7/11 will be in the third quarter of FY 2006. Production of these refurbished CSAs is scheduled to continue to the end of FY 2008. The plan also calls for some selective non-destructive evaluation (NDE) and screening of CSAs as a risk mitigation effort for other warheads during FY 2003 and FY 2004. 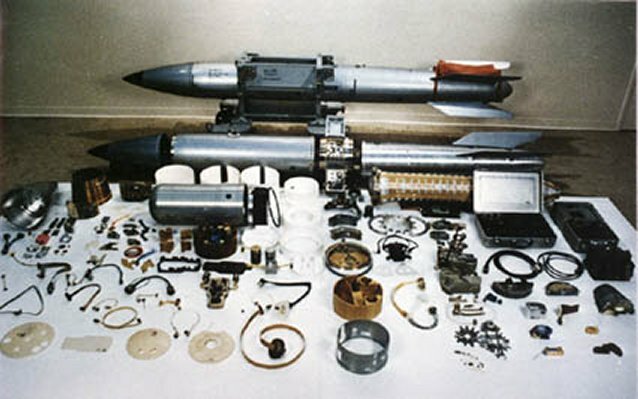 Some secondary components in the B61-7/11 show signs of aging that could affect warhead reliability, if left unchecked. B61-7/11 refurbishment, scheduled to begin in FY'06 , will include secondary refurbishment and replacement of some foam support, cables, and connectors. In FY 2005, Stockpile Management included producing the 1M and 2M reservoirs; conducting pre-production engineering activities for the Alt 356/358/359 spin rocket motor; continuing surveillance tests for the B61-3/4/10 and the B61-7/11 (approximately 11 per family per year at present sampling quantities); disassembling and inspecting the stockpile laboratory tests units; and conducting component laboratory tests and stockpile flight tests for stockpile evaluation. Enduring stockpile workload efforts on all modifications of the B61 will include ongoing assessment and certification activities; cyclical limited life component exchange activities; surveillance activities; and any required alterations, modifications, repairs, safety studies, and military liaison work. In FY 2005, activities include supporting the annual assessment process; conducting laboratory and production plant safety studies and implementation of Seamless Safety for the 21st Century; provid ing laboratory and management support to the Project Officer's Group and DoD Safety Studies; and support of resolution of Significant Finding Investigations. R&D efforts include the following: submit data for surveillance cycle reports; conduct integrated experiments per current approved baseline plan; conduct development, design, and peer reviews on the spin rocket motor; and, support stockpile flight tests of the spin rocket motor. 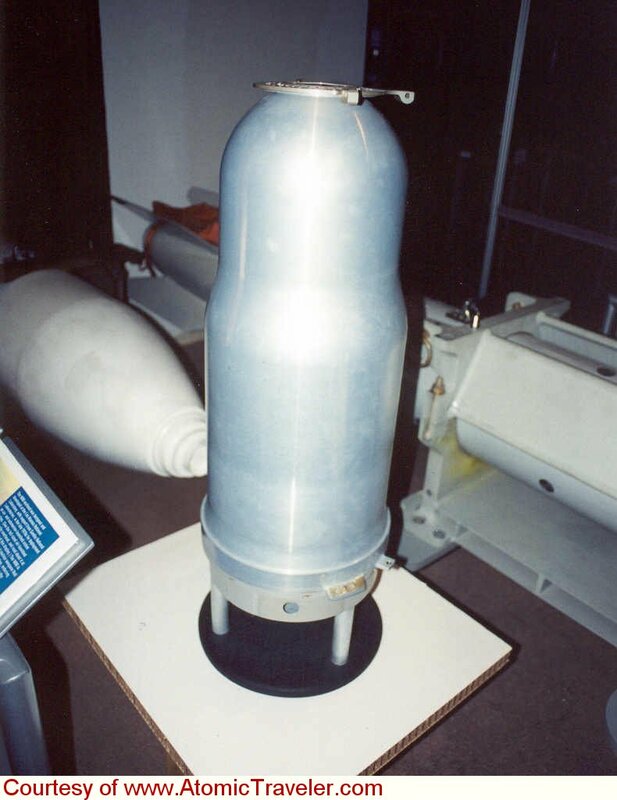 In June 2006 the Department of Energy's National Nuclear Security Administration (NNSA) completed a six-year effort to deliver the first refurbished B61 nuclear bomb. This program will extend the life of the B61 Mod-7 and Mod-11 strategic bombs in the U.S. nuclear weapons stockpile. It is part of an ambitious effort, which helps to ensure that the nation's aging nuclear weapons stockpile is capable of meeting national defense requirements without conducting underground nuclear tests. The purpose of the B61 refurbishment is to extend the bomb's life by 20 years. Every part of NNSA's nuclear weapons complex contributed to this effort through design, production or review work. "Completing the B61 first production unit is an important step in keeping our nuclear weapons stockpile safe and reliable. Our nuclear weapons were never intended to last this long and they were not designed to be taken apart, so it is a credit to our scientists and engineers across the complex who have come together to deliver this unit on time," said NNSA Deputy Administrator for Defense Programs Tom D'Agostino. The B61 bombs are an integral part of the nation's strategic defense and are the oldest weapons in the nuclear stockpile, many of which were originally produced in the late 1960s and early 1970s. The B61-7/11s were slated to be refurbished by fiscal year 2009. This key bomb is being upgraded with precision guidance equipment and safety mechanism. “It is the right course of action to cost-effectively extend the life of our weapons, modernize our infrastructure and preserve our deterrent capability,” C. Robert Kehler, commander of the US Strategic Command, told lawmakers at a Capitol Hill hearing 29 October 2013. Kehler and other officials told the House Armed Services Subcommittee on Strategic Forces that the B-61, the oldest nuclear bomb in the US arsenal, is being modernized with a precision-guidance kit that will replace a parachute used to slow the weapons descent. The upgrade entails combining four 1960s-era variants of the B-61 into a single bomb. 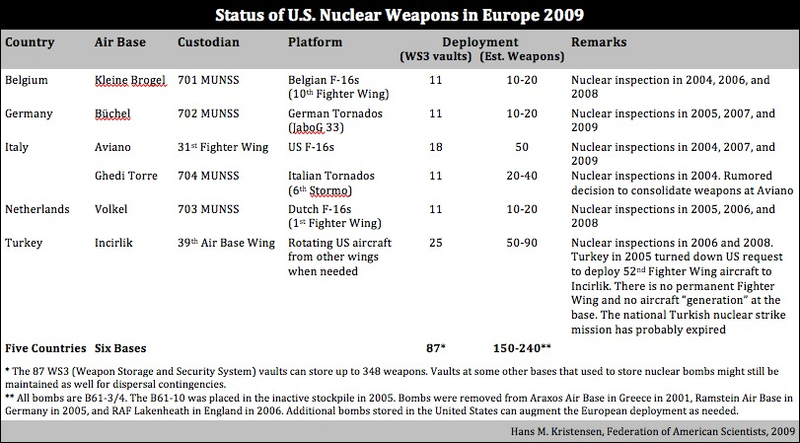 The United States maintains around 400 B-61 bombs, some 200 of which are deployed in Europe. Officials also told lawmakers they are concerned about budgetary belt-tightening that could negatively impact the state of the US nuclear arsenal, including a so-called “life extension program” to repair and replace components of nuclear weapons. “Today, the most significant risk the program faces is not technical risk, but uncertainty of consistent funding,” Donald Cook, deputy administrator for defense programs with the US National Nuclear Security Administration (NNSA), said in a prepared statement for the hearing. Some members of the US Congress consider the life-extension program too costly and potentially unnecessary. “I’m concerned about the cost and complexity of the current plan and whether [the B61 bombs] are needed long term,” US Rep. John Garamendi, a Democrat from California, said during the hearing. The NNSA estimates the cost of refurbishing the B-61 at $8.1 billion over 12 years, and US President Barack Obama earlier this year asked Congress to increase the budget for the bomb to $537 million in 2014, up from $369 million in 2013. Federal budget battles, however, resulted in a $30 million cut to the life-extension budget this year, prompting NNSA officials to mobilize nearly $250 million in reserve funds in preparation for possible additional costs later on, according to the report.